"Vacation" means a period of suspension of work, study, or other activity usually for rest. However, are you going to let your child spend summer vacation wasting time? You can't even bear the thought of sending him abroad, and an English camp is just too clichéd. Now you would think there would be something for your child that's productive, yet fun, to release all the stress from school and peers. For those parents who are worried about how to spend summer break, "Walkerhill Kids Camp 2007 – Be a Musical Star" will solve your problems. The fifth annual Walkerhill Kids Camp offers children the opportunity to star in a musical in English, and well as fulfill their dreams of becoming a celebrity. The featured musical will be compilations from the internationally famous "Sound of Music," "Lion King," and "The King and I." Just the thought of your children singing in English puts a smile on your face, doesn't it? A professional musical performer will be teaching vocals, acting, and jazz dancing first hand to turn the timid and introverted children into talented young stars. On the last day of the camp, all parents will be invited to the musical performance to find out for themselves. The laughter of Walkerhill Kids Camp does not end there. Participants will be able to take advantage of Walkerhill's outdoor pool, River Park - a pool of flowing water with a circumference of approximately five kilometers. 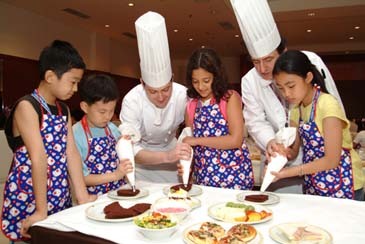 Walkerhill's chef will also be making sandwiches, cookies, and cakes with the children at the cooking class. Various other activities such as a table etiquette class, a BBQ party, an outdoor recess with games and cheering at Jade Garden, a magic show, camp fire, and more will be enjoyed for the greatest of summer experiences. Children will be provided with boarding in Sheraton Grande Walkerhill's Douglas House Room at two children per room. A formal French course menu, River Park's poolside buffet, and garden BBQ's are prepared for meals.